Every riverbank is unique. 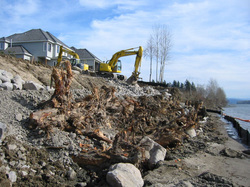 Each project has its own unique set of conditions including bank slope, bank materials, river hydraulics, wave climate and potential causes of failure. 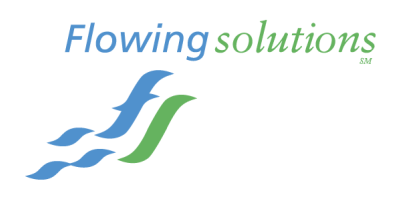 Flowing Solutions approaches problems holistically. We review all of the potential causes, both obvious and hidden. We assess the permit challenges, access challenges and owner goals and budget. Based on these factors, we develop a custom solution which best meets all conditions. 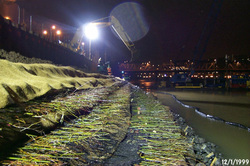 We designed this Bio-engineered riverbank utilizing 100% biodegradable materials. Lifts of Coir fabric, large willow cuttings and amended soil fill ensured planting success. The design also included an innovative storm water treatment swale behind the bioengineering. This system treats water from the upland plaza and helps to maintain water quality in the Willamette River. We have installed numerous bio-engineered riverbanks and closely monitor their success. This solution is not without risk which should be discussed prior to implementation. 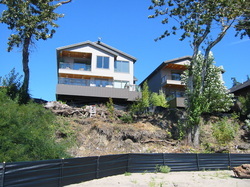 This project had limited access, could not use hydraulic equipment, was oversteep, in an area of high energy, and the bank could not be laid back due to existing house location. After reviewing the conditions, we discovered the cause to be infiltration dry wells which were required by the original development permit. These wells were introducing water into the ground and causing bank failure. We modified the wells to eliminate this problem, then discovered a newer product which utilizes geotextile fabric bags and patented connection plates. 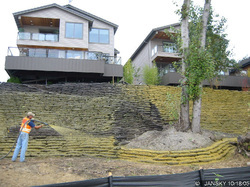 This project included 200 lf of riverbank at a 1:1 slope, typically only achieved by rip-rap. We have completed several projects with this solution, and it also has risks and limitations that should be understood.